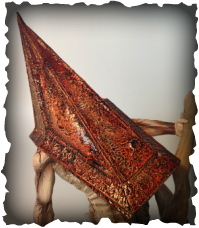 The Silent Hill 2 Red Pyramid Thing statue was created by Gecco Japan and was made exclusive to San Diego Comic Con 2013. The statue has to be assembled when taken out of the box but its assembly is easy (Just the blade placed into its socket). This statue is limited to 1500 pieces. The Silent Hill 2 Bubble Head Nurse statue was created by Gecco Japan and distributed by Toymunkey Studios. 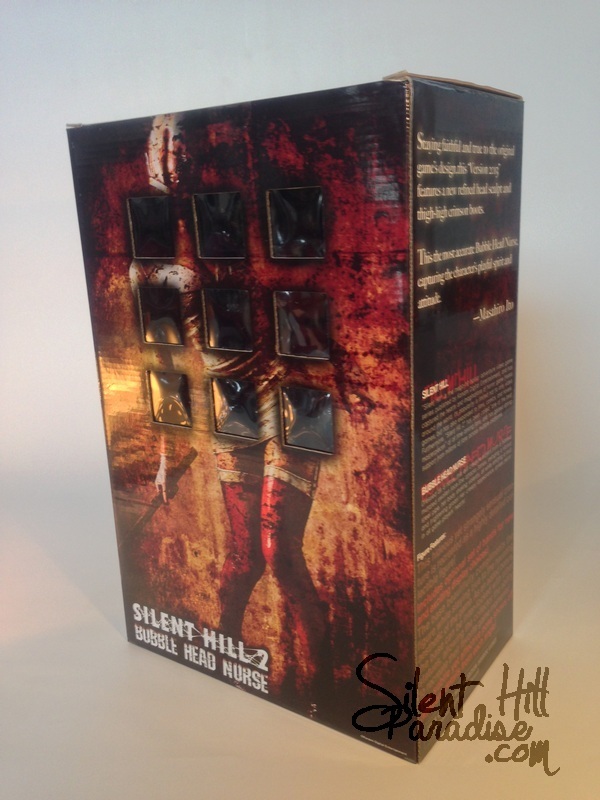 This statue has to be assembled when taken out of the box but its assembly is easy! 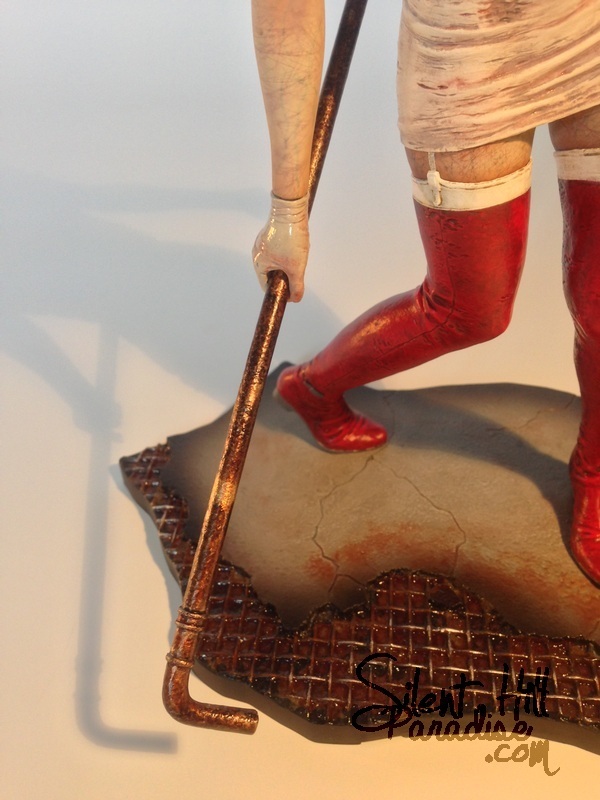 The nurse also comes with an additional pair of hands so she can hold the steel pipe in either her right or left hand. 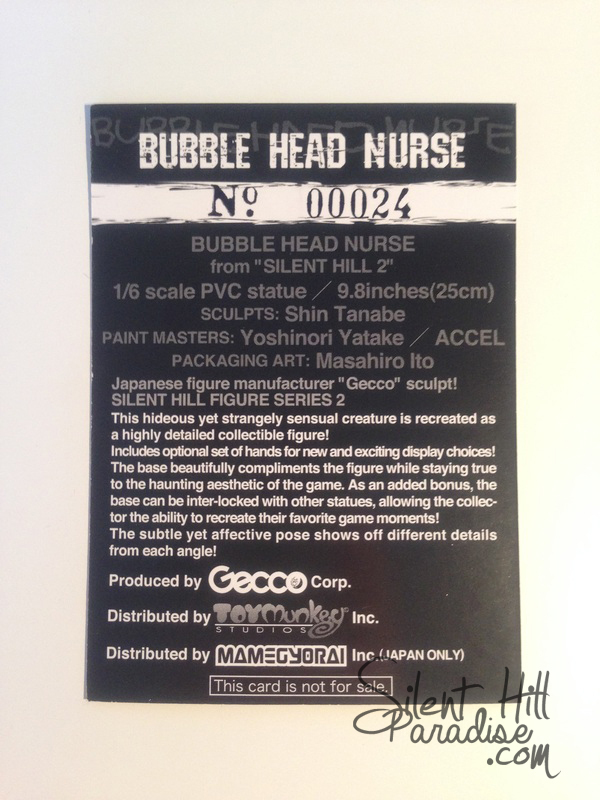 The Silent Hill 2 Red Bubble Head Nurse statue was created by Gecco Japan. 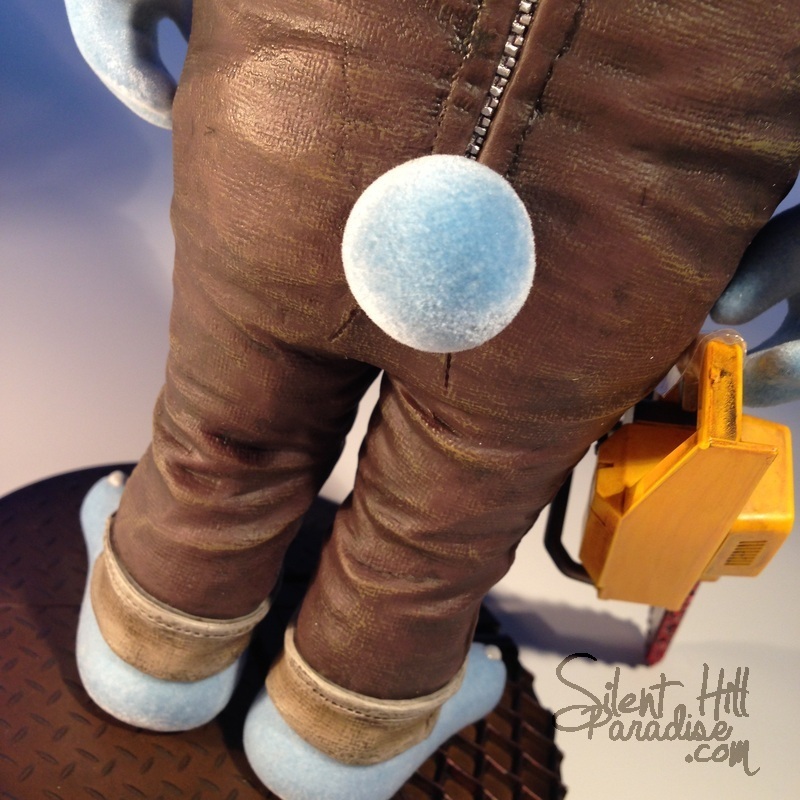 The statue has to be assembled when taken out of the box but it's assembly is easy! The nurse also comes with an additional pair of hands so she can hold the steel pipe in either her right or left hand. 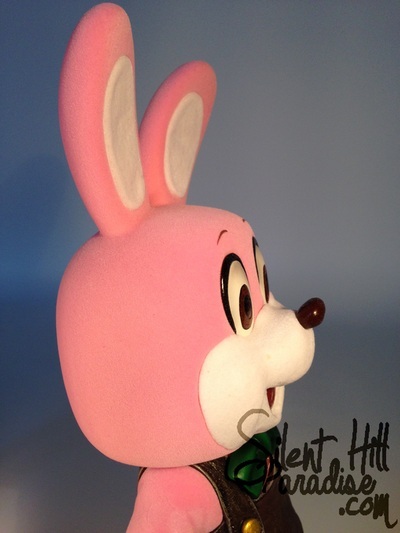 This version of the Bubble Head nurse is limited to 1500 pieces and was exclusive to ComicCon 2013 although she could also be ordered via the Toymunkey website. 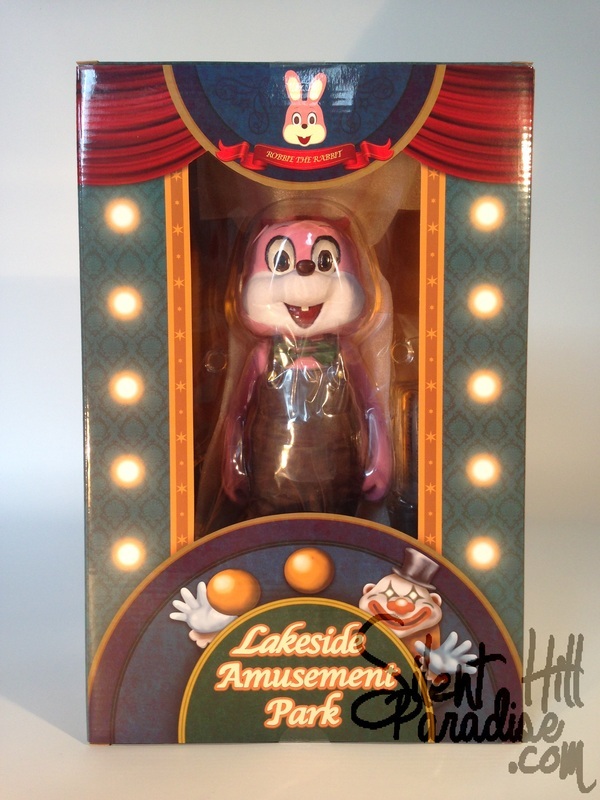 Along with the additional hands she also comes with an additional head! 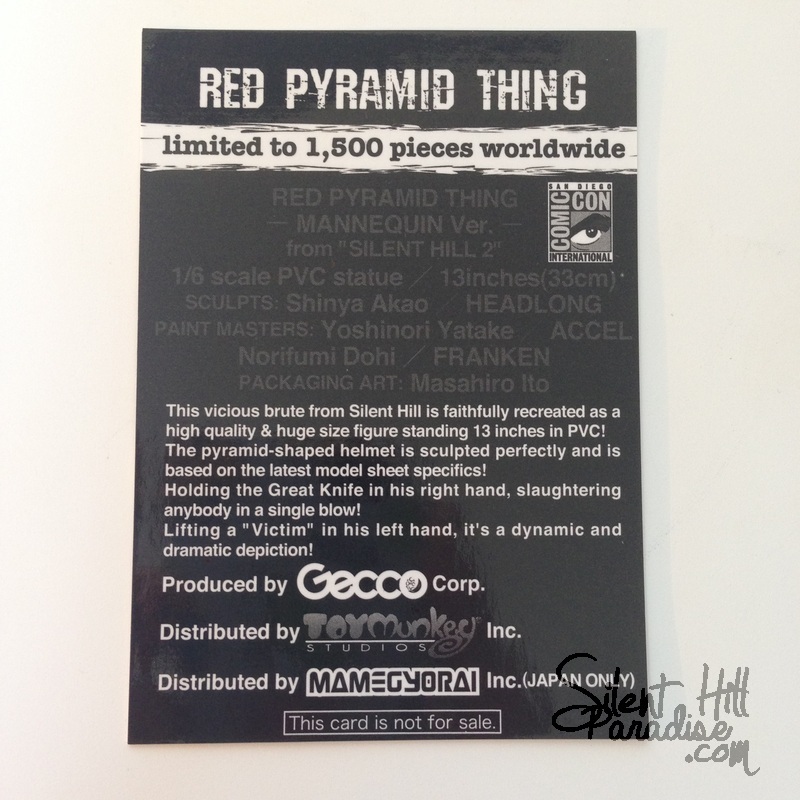 The Silent Hill 2 Red Pyramid Thing statue was created by Gecco Japan and distributed by Toymunkey Studios. 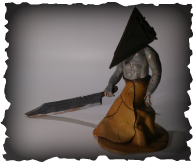 The statue has to be assembled when taken out of the box but its assembly is easy (Just the blade placed into its socket). 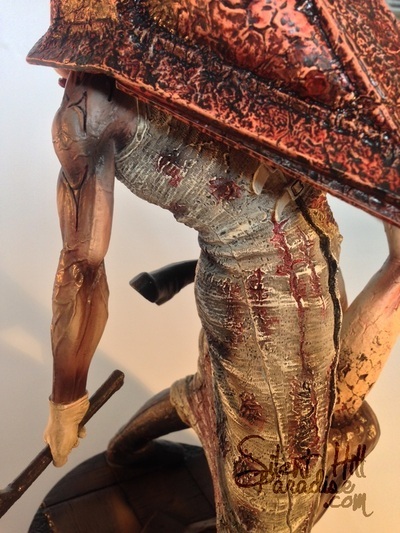 The Red Pyramid Thing statue comes in two variants. The first and most popular is this one which comes with him holding a Lying figure. 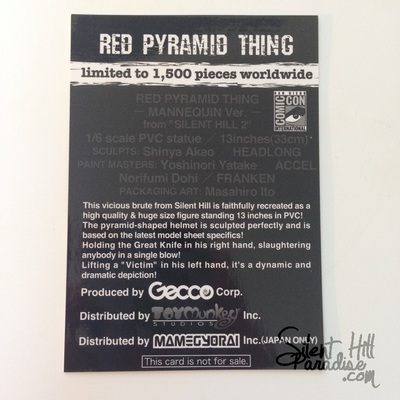 The second Red Pyramid Thing figure was exclusive to ComicCon 2013 and features him holding a Mannequin Monster. 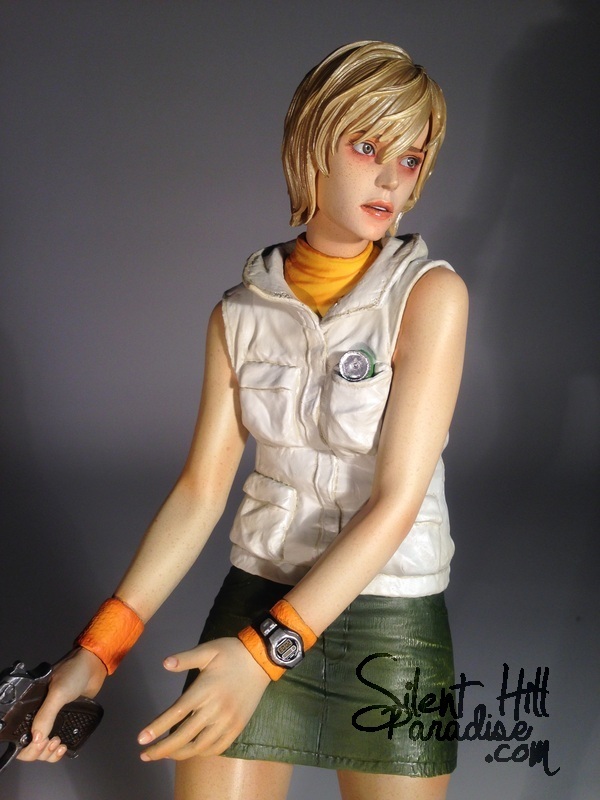 The Heather Mason statue was created by Gecco Corp and was released in January 2014. 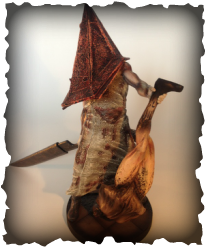 Heather stands at a total of 25cm's tall and comes with three weapons and an additional hand. 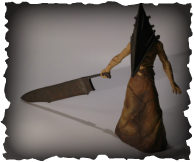 The weapons included are a steel pipe, Hand gun and Beam Saber which is only available upon completion of the game using only Melee weapons. 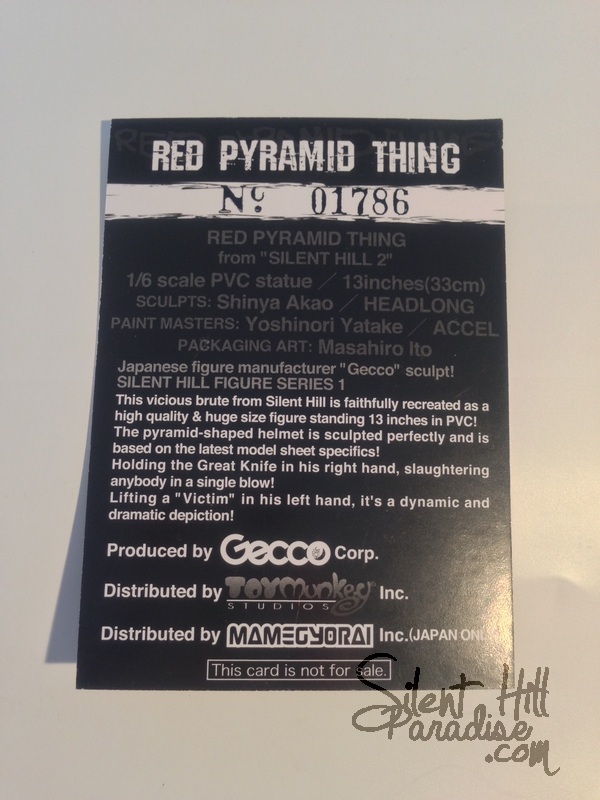 Unlike previous Silent Hill statues from Gecco Heather comes with a small info card but this time it does not contain the number of which Heather you own. The Pink Robbie the Rabbit statue was created by Gecco Corp and was released in March 2014. 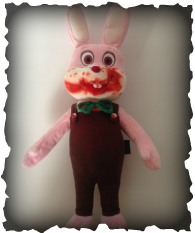 Robbie stands at a total of 34cm's tall and comes with two weapons and a removable base. The weapons included are a steel pipe and a black handled chainsaw. 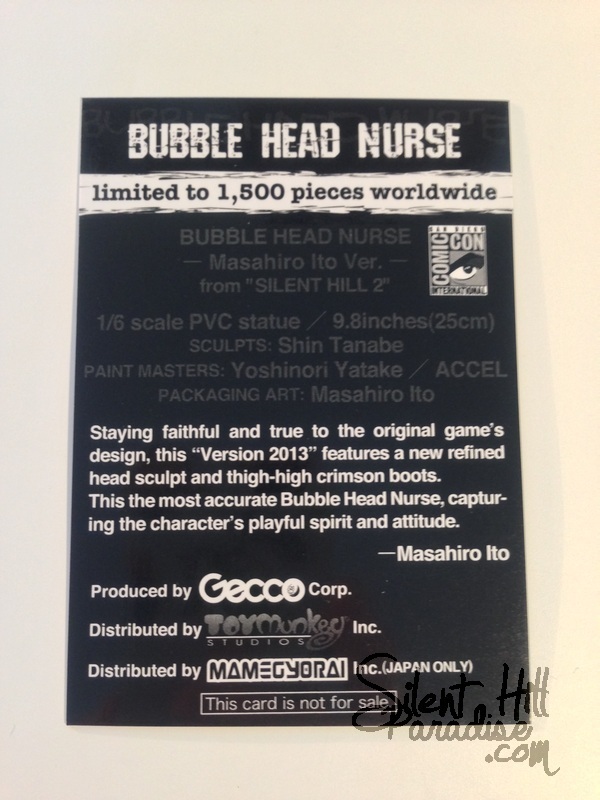 Unlike previous Silent Hill statues from Gecco Robbie comes with a small info card but this time it does not contain the number of which Robbie you own. 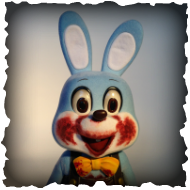 The Blue Robbie the Rabbit statue was created by Gecco Corp and was released in March 2014. 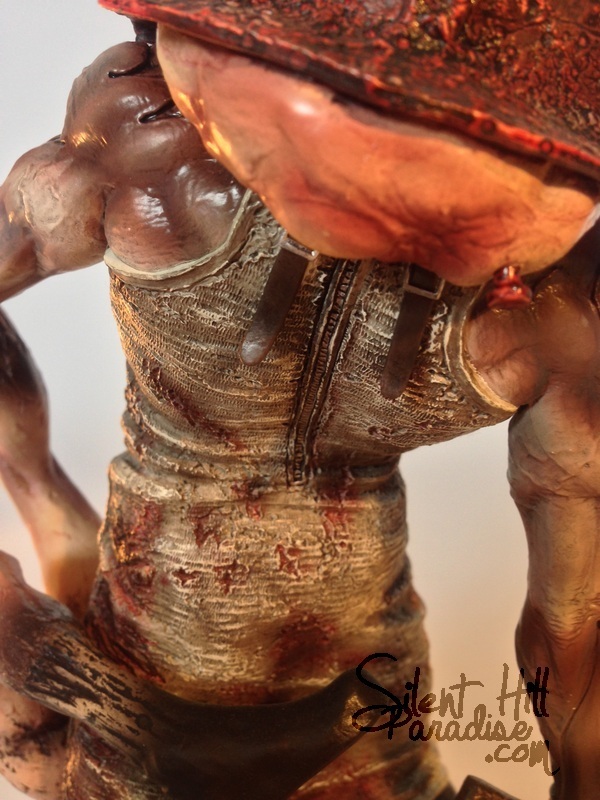 Unlike previous Silent Hill statues from Gecco, Robbie comes with a small info card but this time it does not contain the number of which Robbie you own. 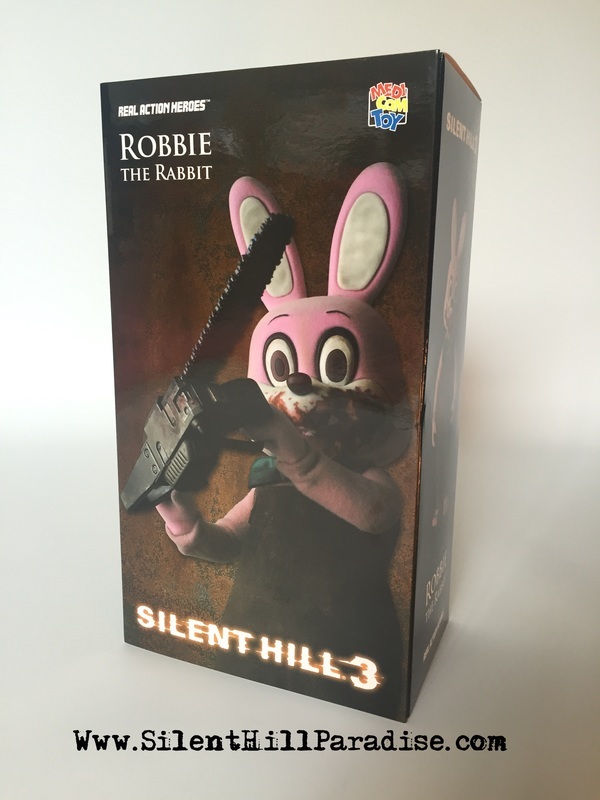 The Blue Robbie statue is limited to 3000 pieces. 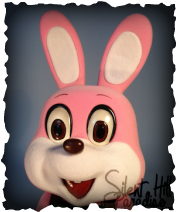 The Souvenir Robbie the Rabbit statue was created by Gecco Corp and was released in March 2014. 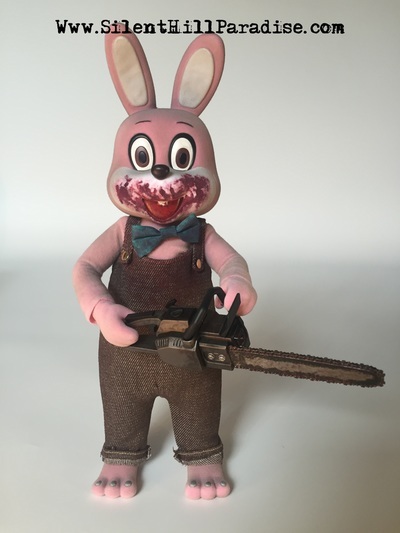 Robbie stands at a total of 34cm's tall and comes with two weapons and a removable base. 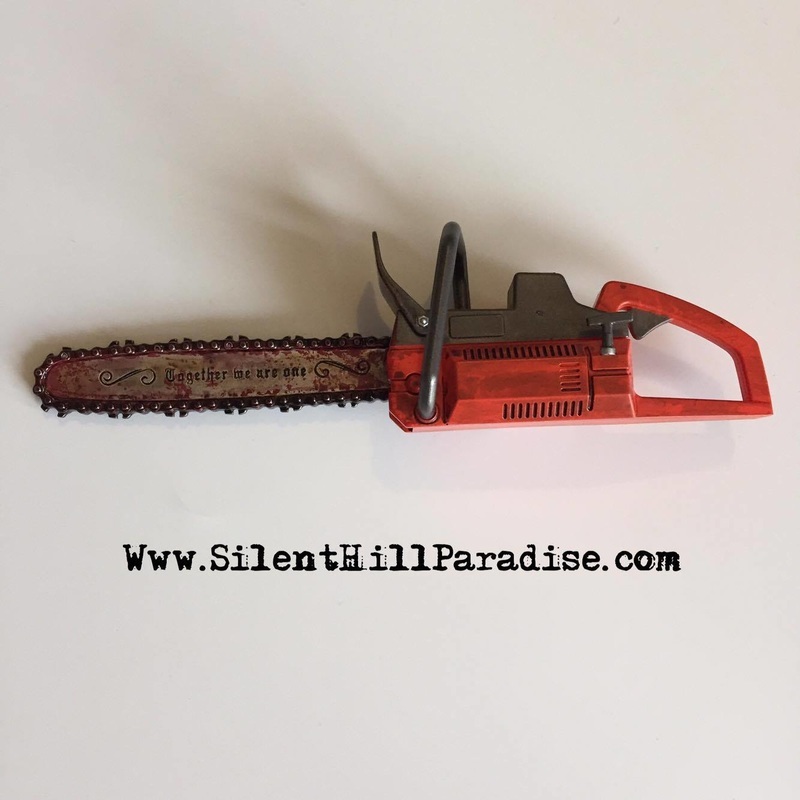 The weapons included are a steel pipe and a black handled chainsaw. 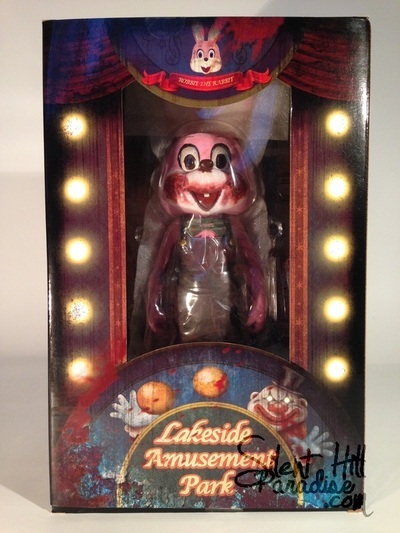 This version of Robbie features Lakeside Amusement Park, Souvenir style packaging. 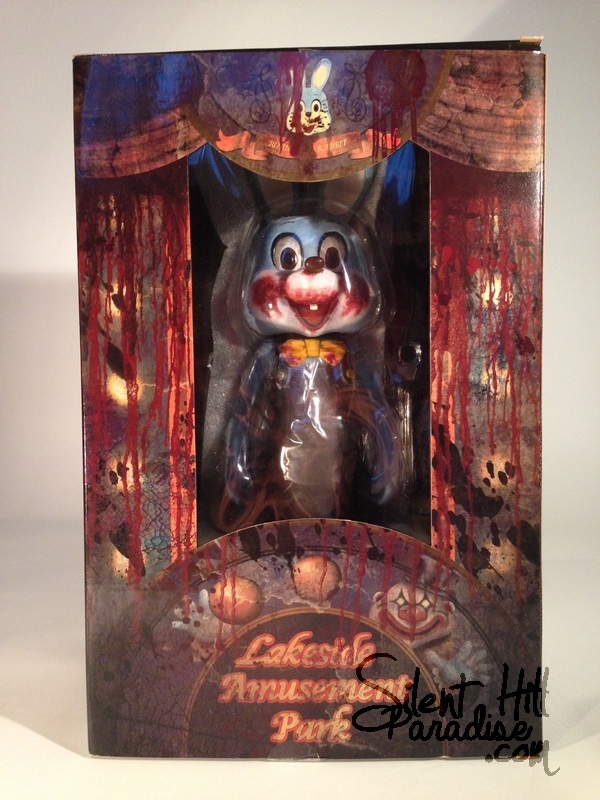 The statue and packaging also features no blood at all. Unlike previous Silent Hill statues from Gecco, Robbie comes with a small info card but this time it does not contain the number of which Robbie you own. The Souvenir Robbie statue is limited to 300 pieces and exclusive to Japan. 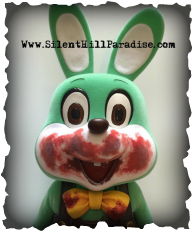 The Green Robbie the Rabbit statue was created by Gecco Corp and was released in March 2016. 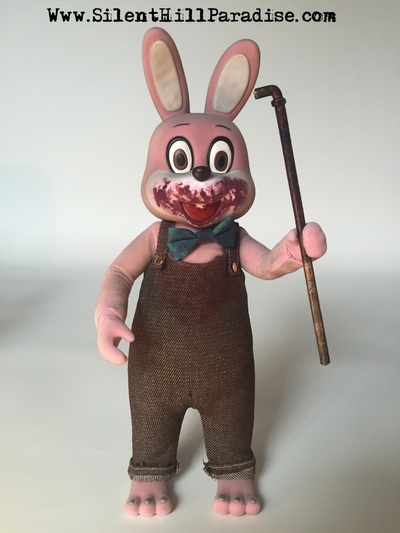 Robbie stands at a total of 34cm's tall and comes with two weapons and a removable base. 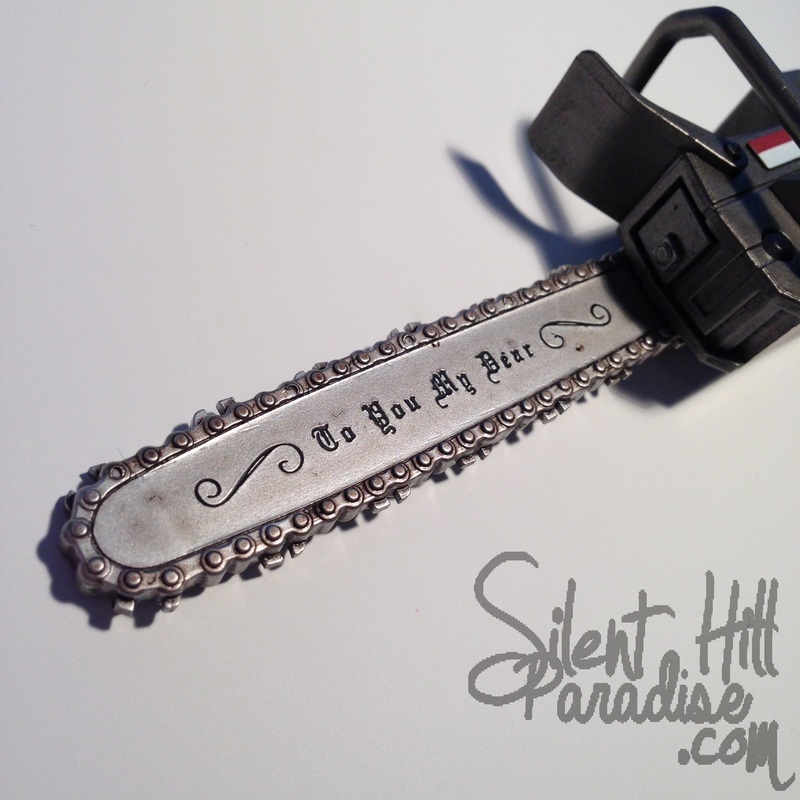 The weapons included are a gold pipe and a red handled chainsaw. 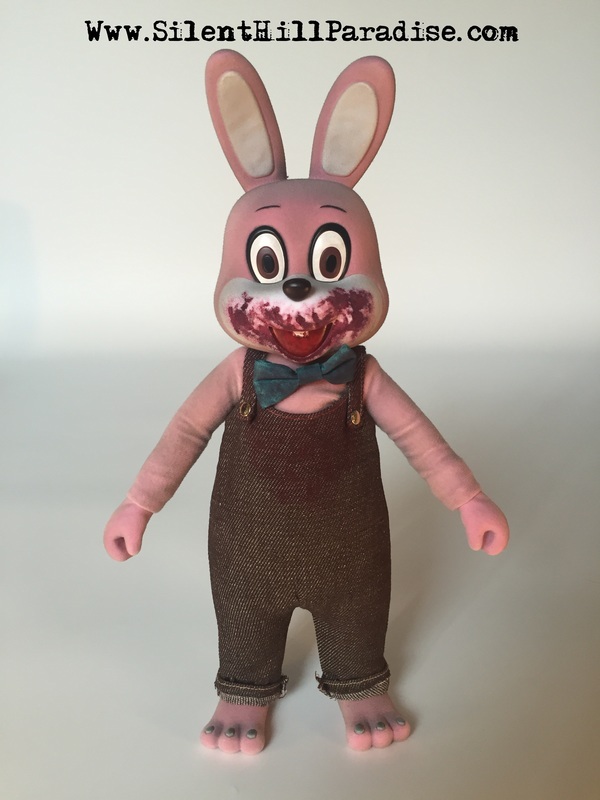 Released by Medicom Toy in July 2015. 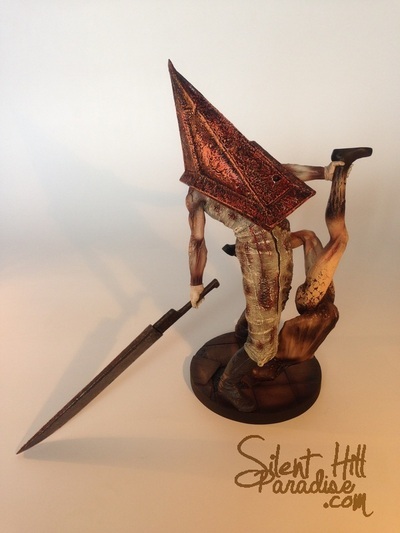 This figure is posable and comes with a steel pipe, chainsaw and clear plastic stand. He's similar to the Gecco statue's in the fact he is around the same size and also flocked. 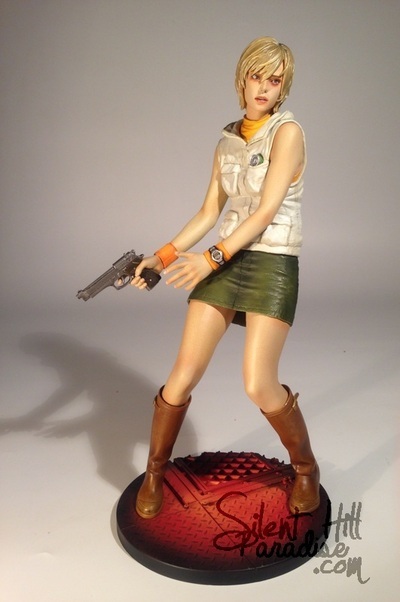 You can read my review of this figure by clicking here. 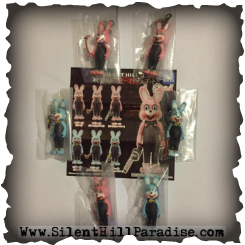 These Robbie the Rabbit Gashapon mini figures/keychains were released in December 2015. A total of 6 available although both the pink and blue Robbies come in 3 identical variants. 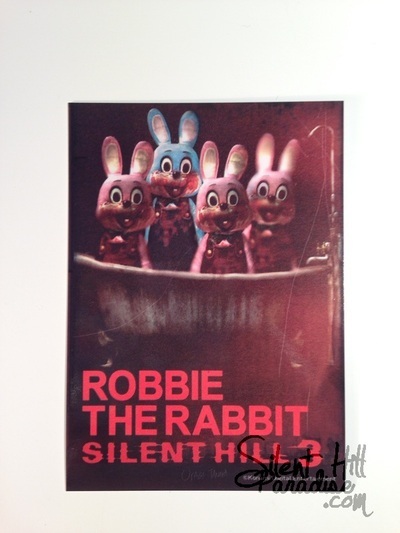 A choice of either Robbie, Robbie with a Chainsaw or Robbie with a steel pipe. 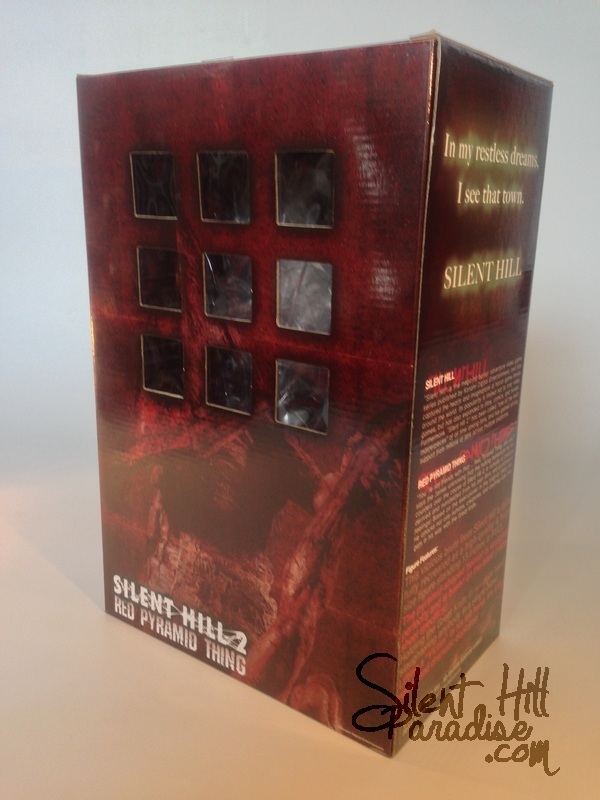 Each figure also comes with a leaflet showcasing the full set. 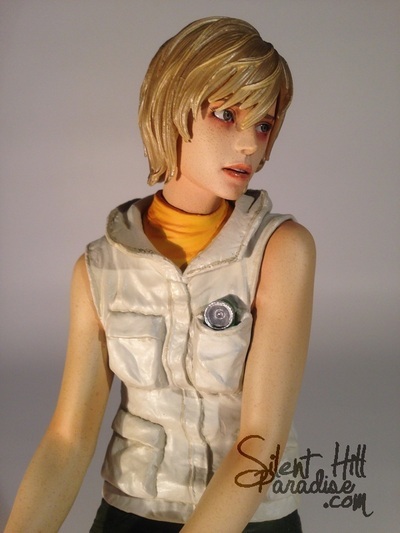 This figure came with the French Silent Hill Revelation 3D Box set. It is limited to 1500 pieces and each figure is hand number at the bottom. The figure comes in two pieces (blade and body). Originally sold via the Konami Style Europe online store this is the Silent Hill 2 James and Nurse statue. 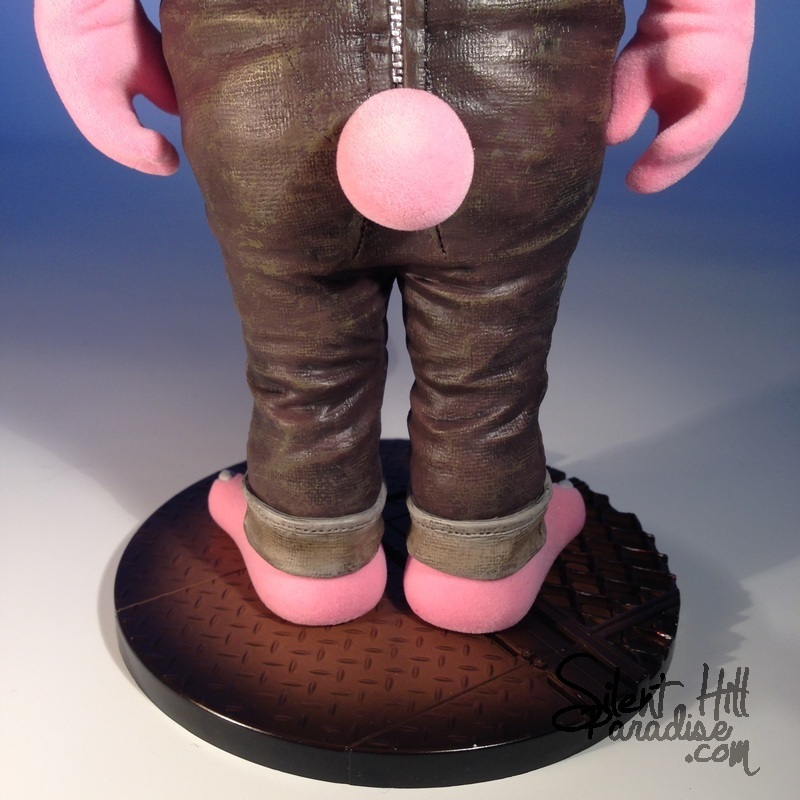 Compared to the paint job on the new Toymunkey figures this one is rather poor with the detail. 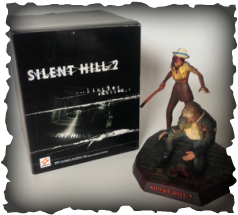 The statue is rather heather and comes in an awesome Silent Hill 2 box. It is Limited Edition but doesn't appear to be numbered at all. 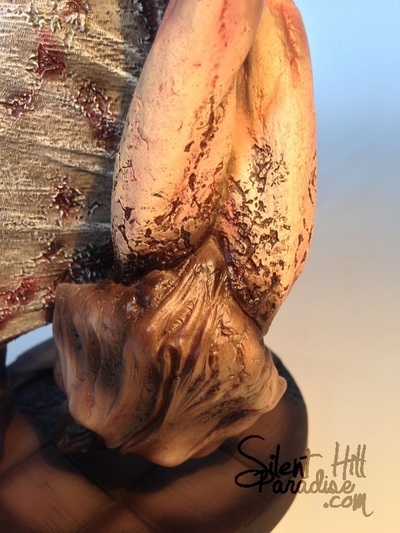 The only assembly this figure requires is the nurse being attached to the base and her left being put into its socket. A small key is also included which is dropped into the drain hole in front of James. I won this item on ebay for quite a good price and when its arrived the seller also included three free Silent Hill Downpour Promotional T shirts! 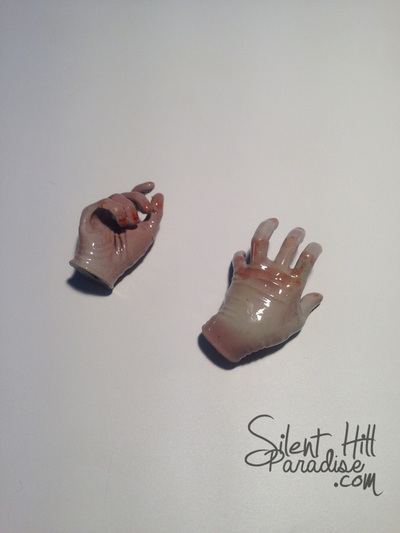 The Glass Butcher paperweight came with all pre-orders of Silent Hill: Zero via the Konami Style Japan Store. 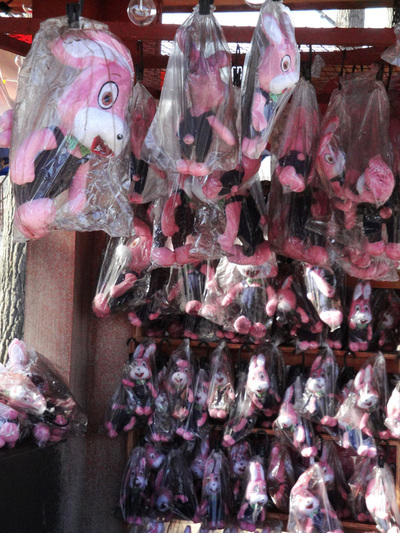 It was exclusive to Japan. The glass Butcher comes in a small black box with the Silent Hill: Zero title and Konami logo printed onto the lid. 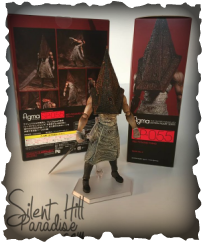 The Red Pyramid Thing Figma figure was released in April of this year (2015) I purchased both of these from AmiAmi.com. 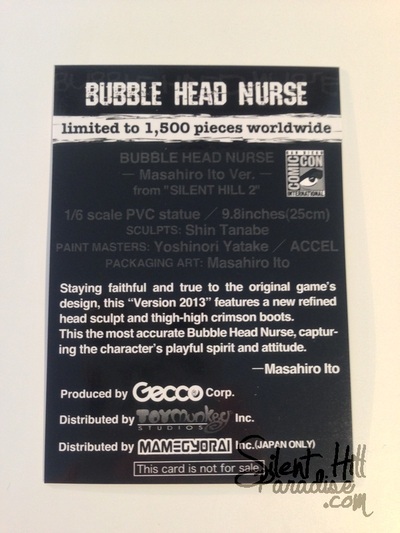 The Bubble Head Nurse Figma figure was released in October of this year (2015). It comes with additional heads, a stand and more. 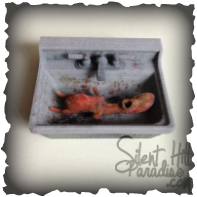 This is a mini 3D Printed model of the creepy baby from the playable teaser known as PT. 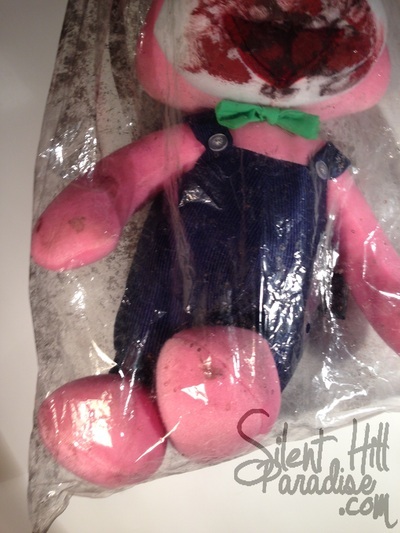 This baby is seen in the sink as you play through the teaser. 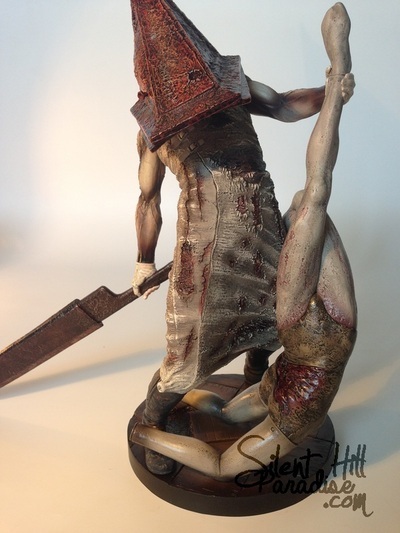 This nurse stands on a circular base with the words 'Silent Hill ' at the bottom. She is part of a resin kit and was painted by myself using acrylics. 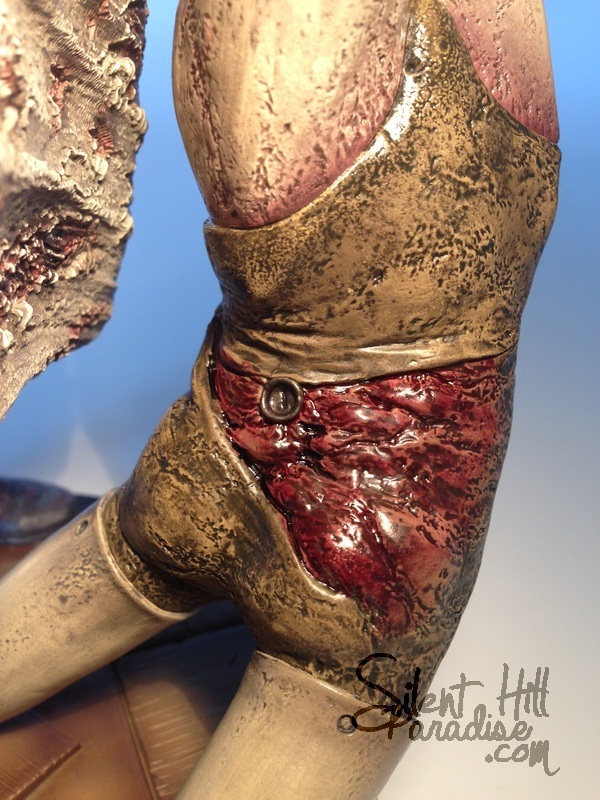 Originally these kits were released by Hellpainter. Although not an original figure this was a resin kit that I purchased via ebay. I then painted and glued it all together. 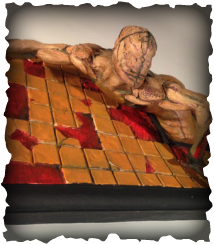 I painted it using acrylics and then used a matt vanished to coat the tiles. 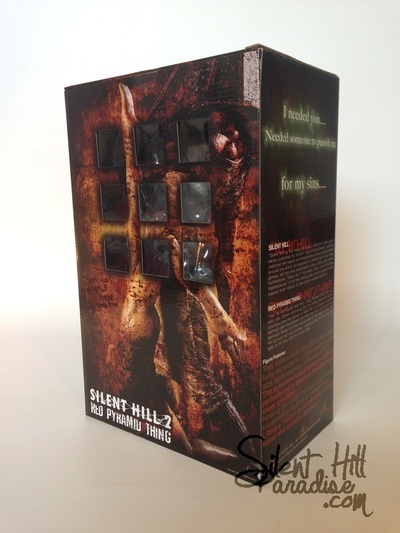 Originally this kit was released by Hellpainter. ​I won this kit on ebay and painted it myself. It came in several parts and so was glued together. 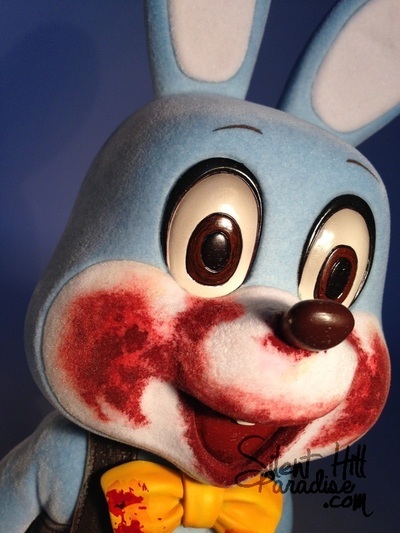 Originally this was released by Hellpainter. 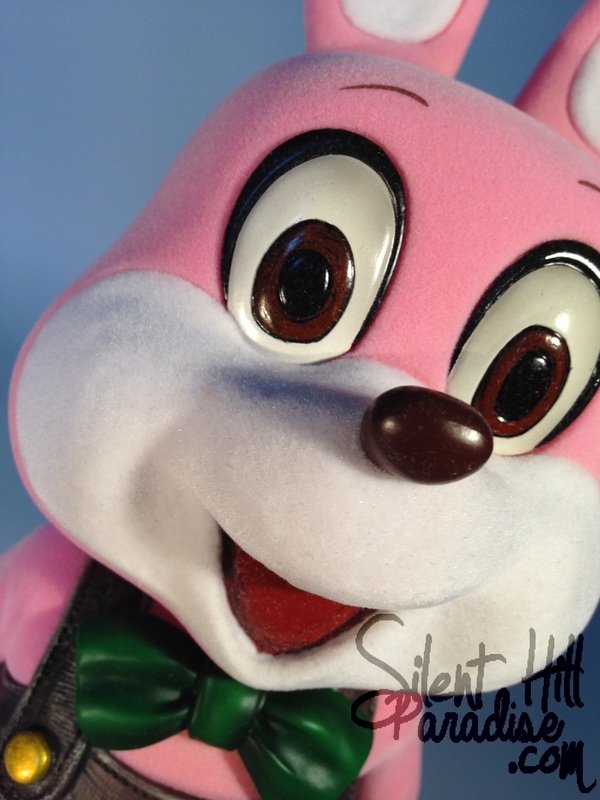 I am really happy with how this turned out in the end. 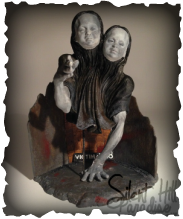 This Twin Victim statue was actually a resin kit that I purchased from Ebay. 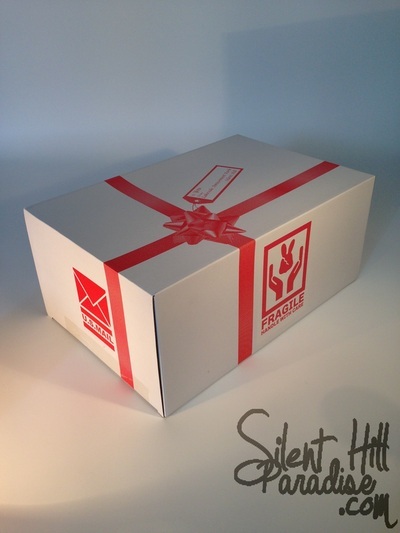 It also included the base. I painted this using acrylic paints. 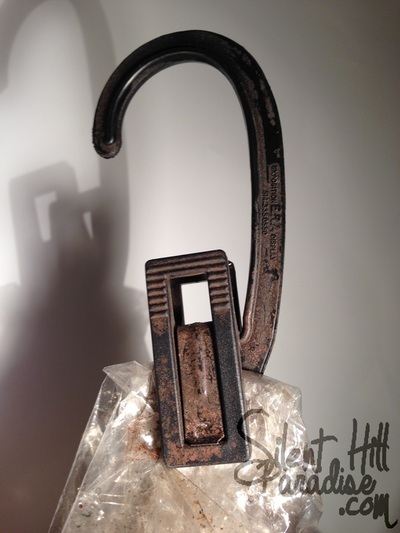 It was a real pain trying to get it to stand up right without falling over but totally worth it in the end. 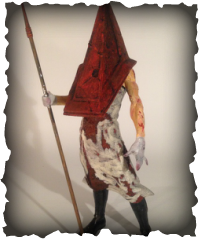 This was the first ever custom figure I made. 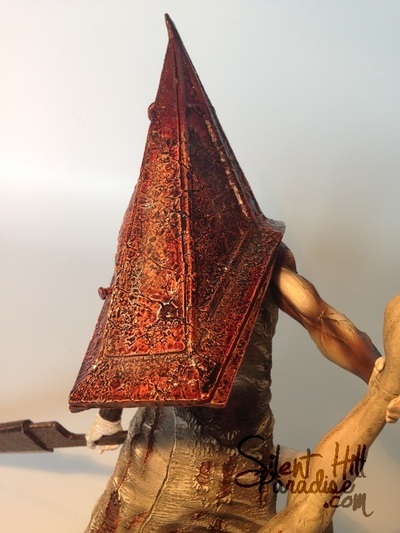 He is made up of four parts, the helmet, body, blade and base. I created him using Polymer Clay which was shaped and then hardened in the oven. 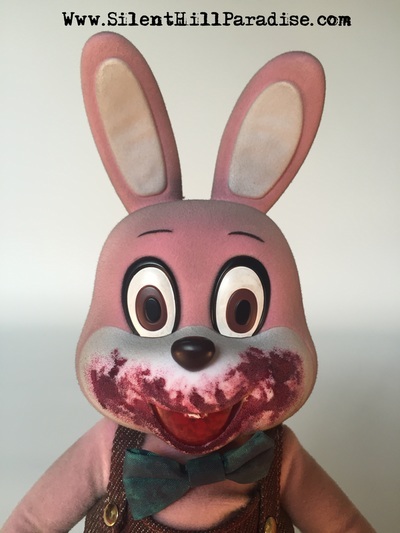 He has been painted using Acrylic paints and additional details added using pen and pencil. 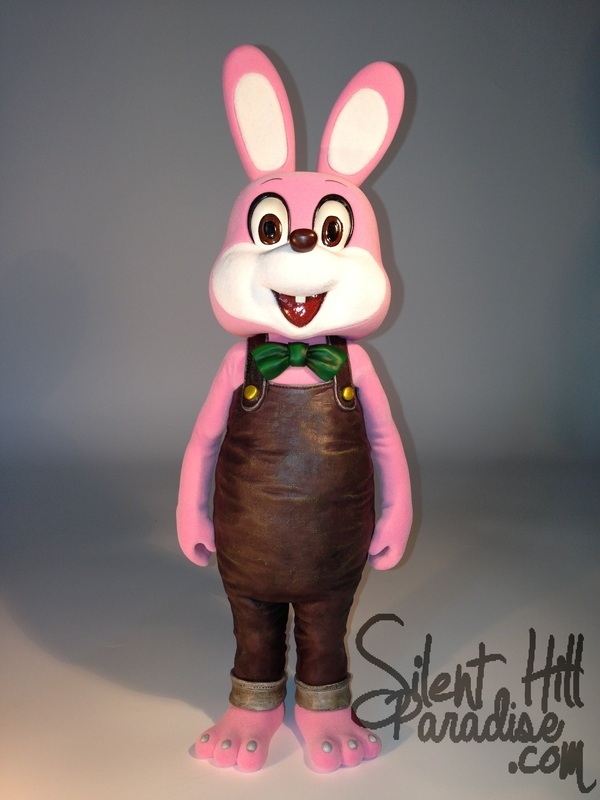 I created this Robbie the Rabbit figure over a period of two days. He is made using polymer clay which was shaped and then hardened in the oven. 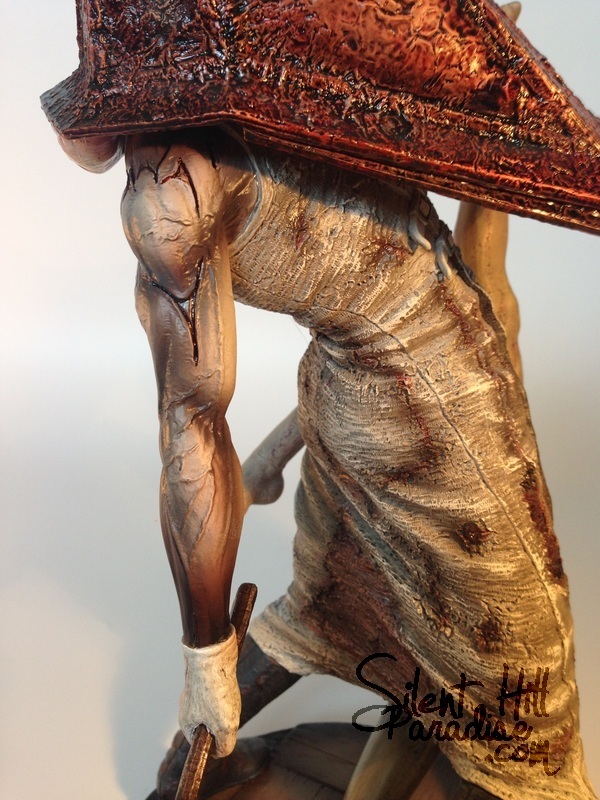 His body was painted using acrylic paints. I created an additional base which appears to be titled. 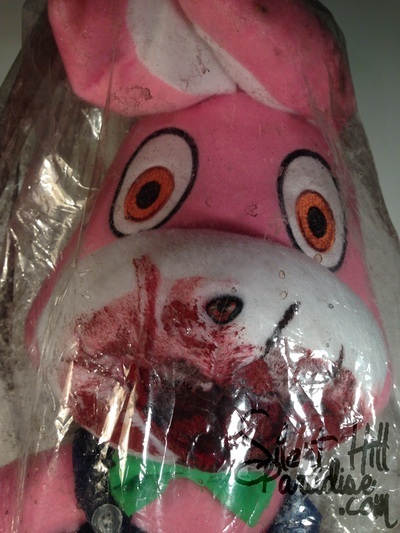 Bloody drag marks have also been painted on the base to give them impression someone (or something) was dragged away. 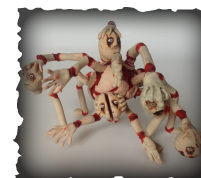 I created this Mannequin Spider figure over a period of three days. 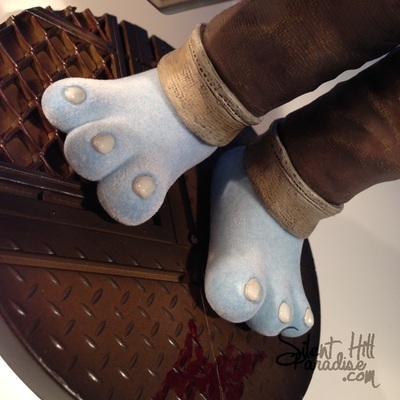 He is made using polymer clay which was shaped and then hardened in the oven. His body was painted using acrylic paints. 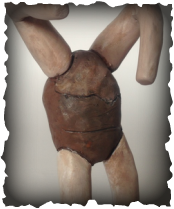 This figure was very complicated to make due to the amount of arms, legs and heads. 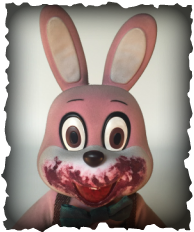 Even though it took a while to make I am quite happy with the outcome! 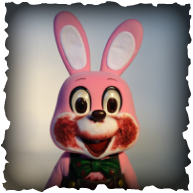 Although I will never make this again! 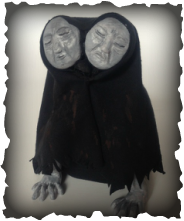 I created this Twin Victim figure in a day. They are made using polymer clay which was shaped and then hardened in the oven. 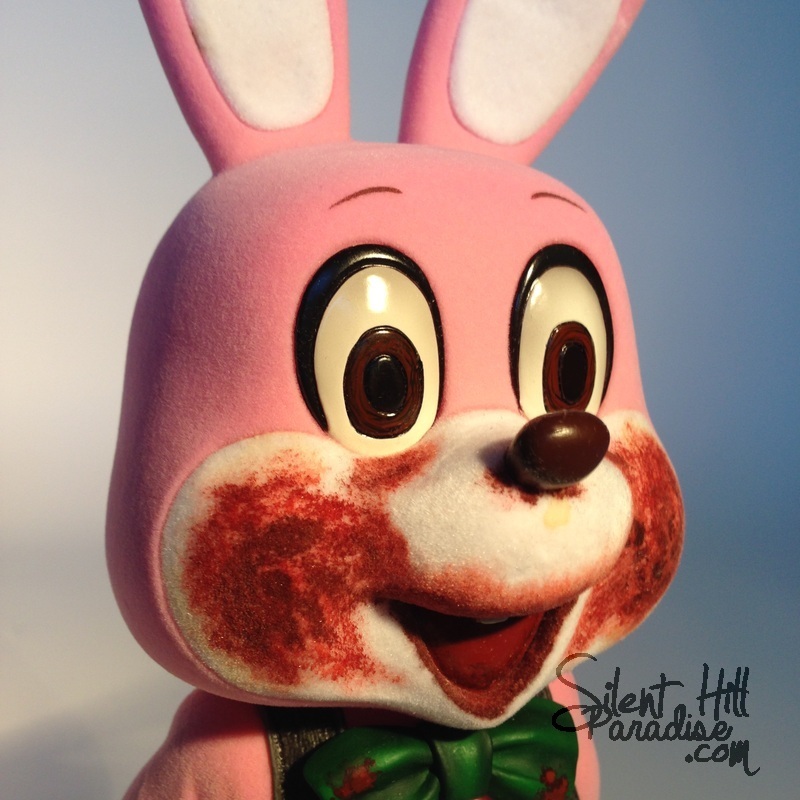 Its body was painted using acrylic paints and covered over with a black piece of fabric. 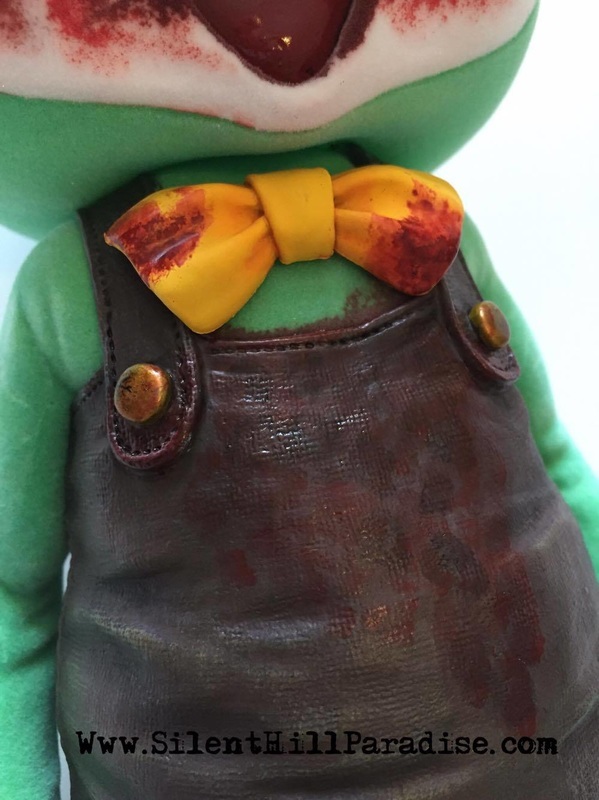 The fabric also has small amounts of paint added to it. This was rather complicated to make simply for the fact under the fabric its body is actually held together via wire! 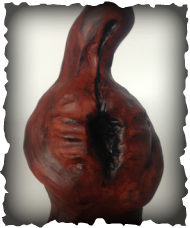 I created this Lying figure over a period of a day. 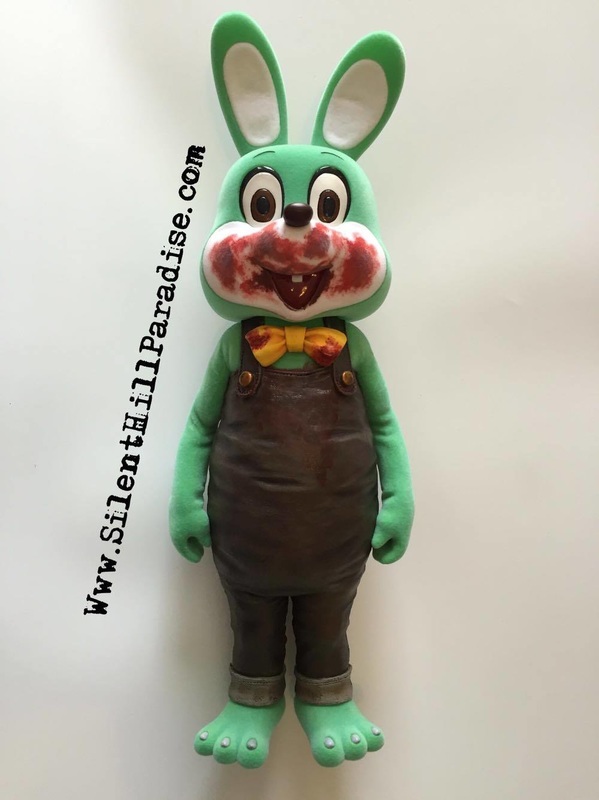 He is made using polymer clay which was shaped and then hardened in the oven. 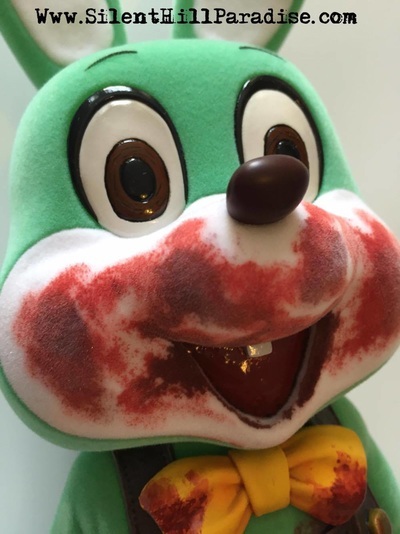 His body was painted using acrylic paints. 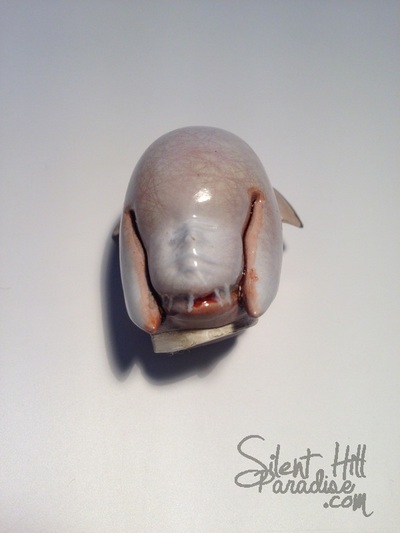 I also added a small amount of pva glue to the hole in its face and chest so when it dried it gives off a wet/shiny look. 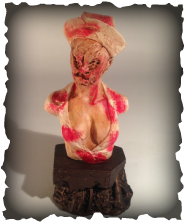 I created this Mannequin figure over a period of a day. 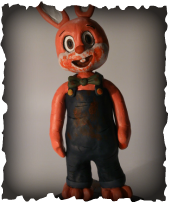 He is made using polymer clay which was shaped and then hardened in the oven. 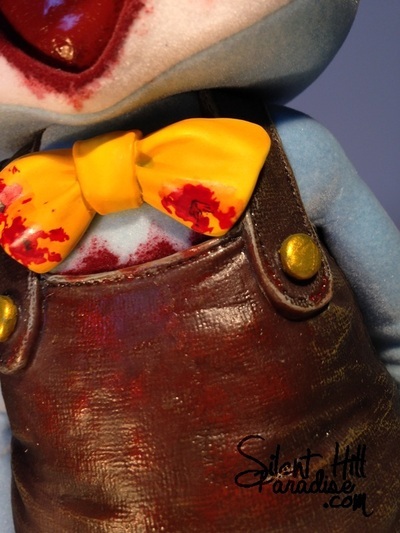 His body was painted using acrylic paints. I think this is my least favourite of all my custom figures. 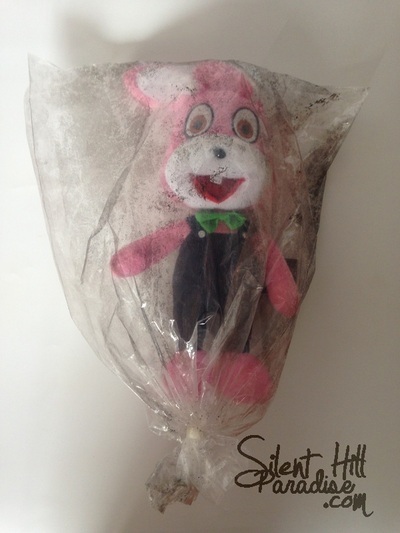 This doll was released by Gaya Entertainment in 2013. 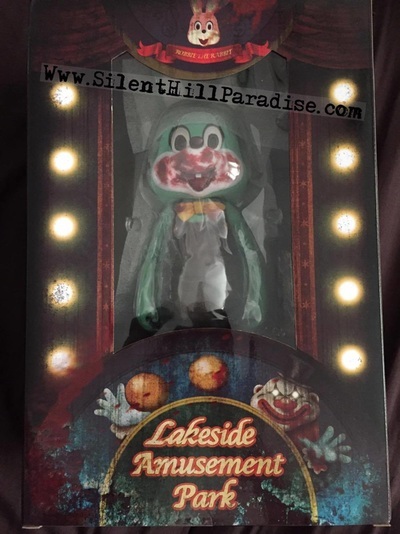 It is sold via game-legends.com. Robbie is around 37 centimetres tall and features a blood stained mouth and clothing. 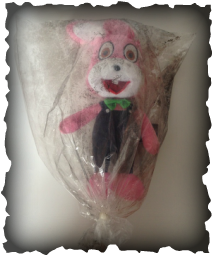 He is light weight and comes in a clear plastic bag. His tag also contains a Silent Hill logo on it. 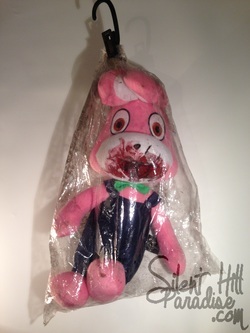 I think this is one of the best pieces of Silent Hill merchandise to be released over the past couple of years! 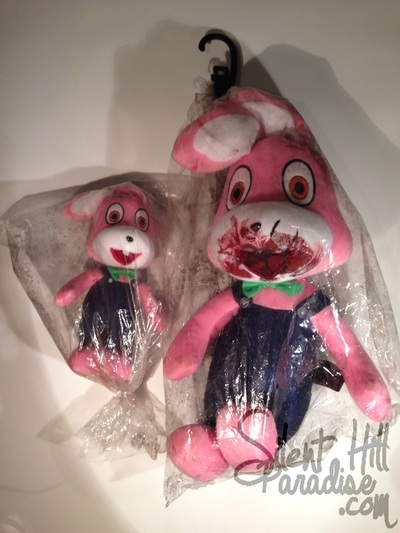 This Robbie the Rabbit doll was used on the set of Silent Hill Revelation. The plastic bag he is in is dirty from the set and I actually got this little guy for free! When Silent Hill Revelation was released a lot of these Robbie dolls were given out as prizes by various websites and companies. The UK appeared to have been missed out with these give-aways and so I assumed I would never get my hands on one! 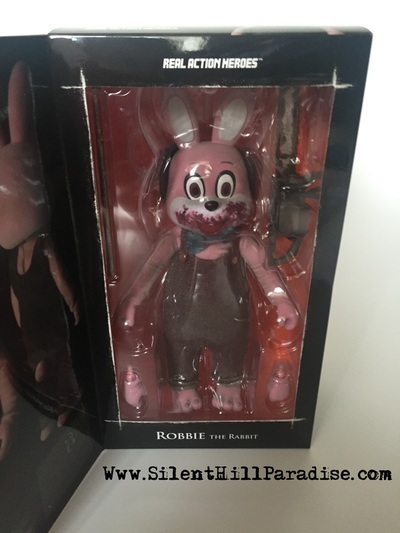 Fortunately I did and although he doesn't look exactly like the Robbie we all know I still think he's pretty awesome and he is definitely one of my most prized items. 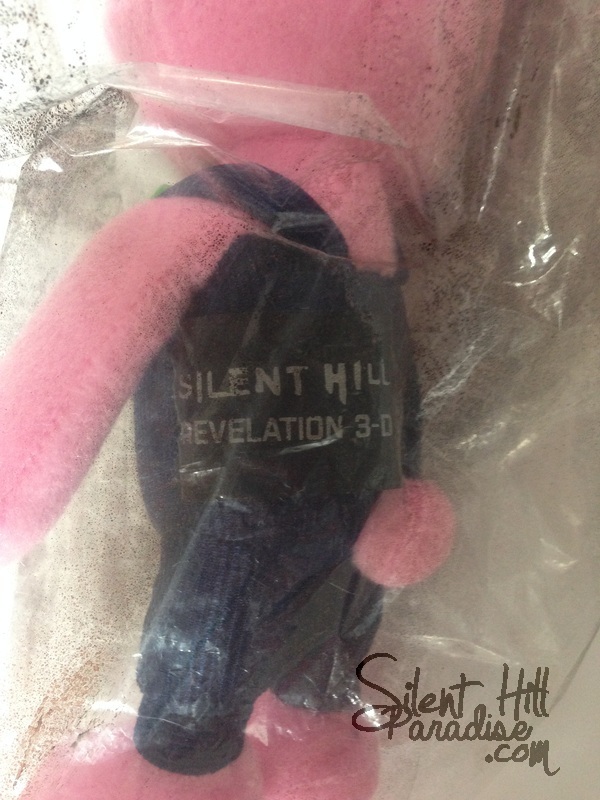 His tag also has the Silent Hill Revelation logo printed onto it. This is the large version of the Robbie the Rabbit doll from Silent Hill Revelation 3D. 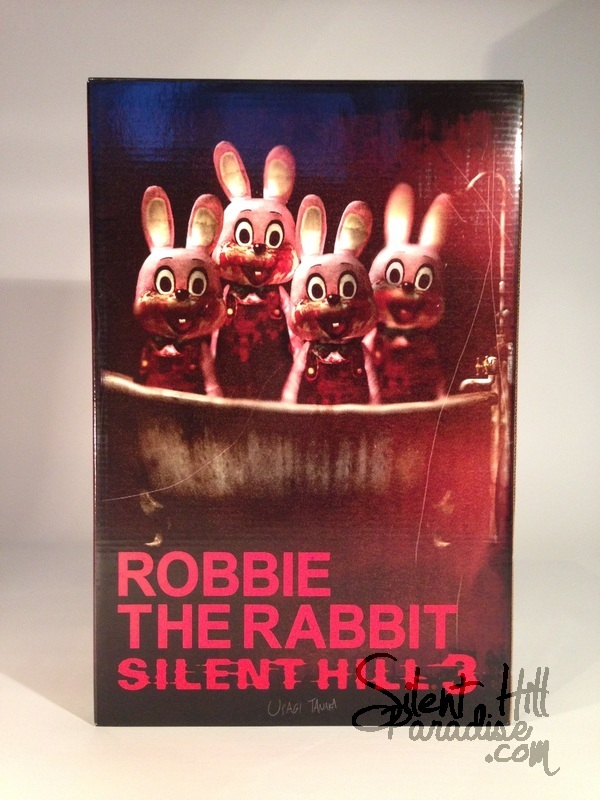 My Robbie also came with a clip which was used in the film to hang him up. This version of the Robbie plush also has blood across his face and very small splatters on his body and clothing. 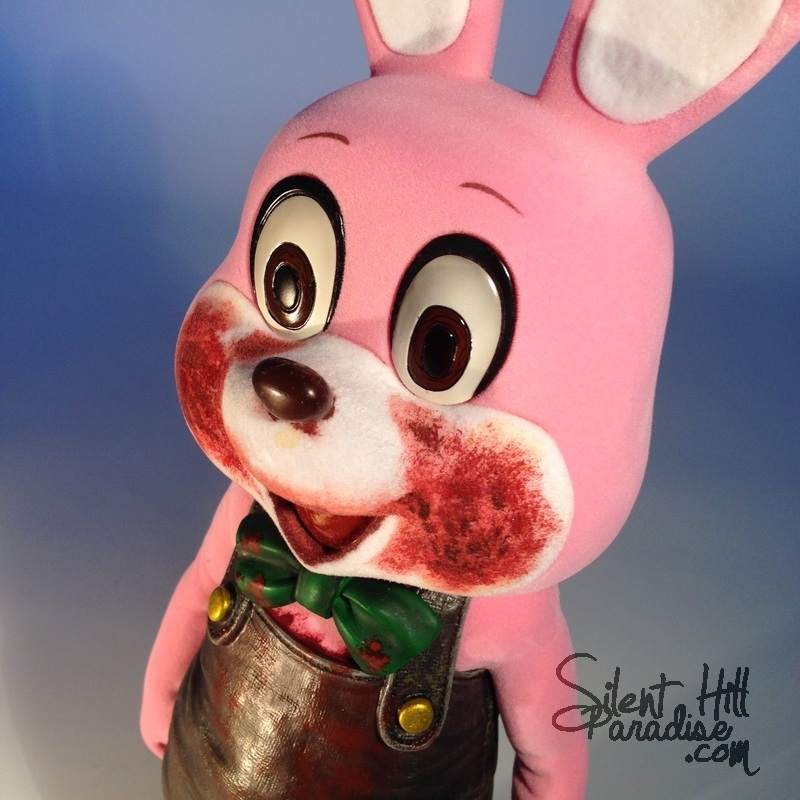 Made by user Our-Ghosts-Remain on Deviantart, She makes and sells custom dolls. 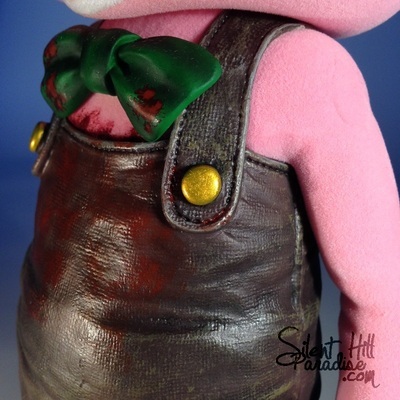 Her original set for sale was of Lisa, Heather and Dark Alessa but I asked if she could also make a Angela doll too and she did! I love these.